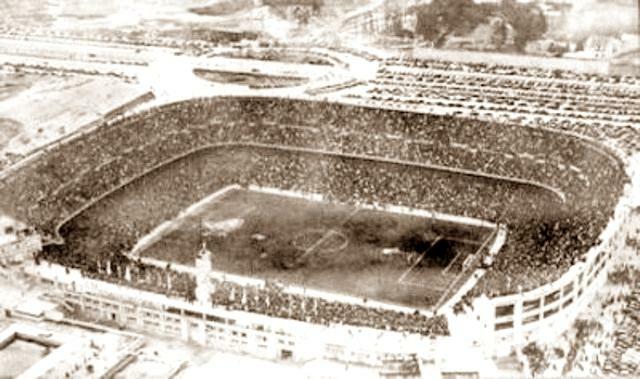 In the early parts of the 20th century, Real Madrid first played at Campo De O’Donnell, and then moved to the larger Campo de Chamartín in 1924. 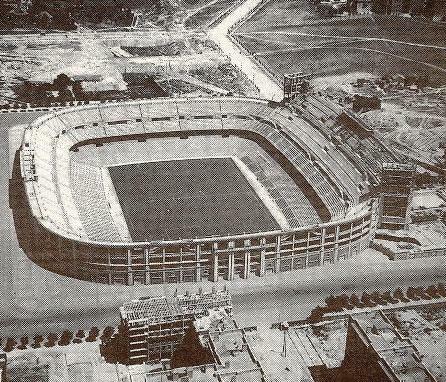 In 1943, Chamartin had already become too small again, and club-president Santiago Bernabéu decided that Madrid needed a new and modern 100,000-stadium. This new stadium got built at the same site of Campo de Chamartín. 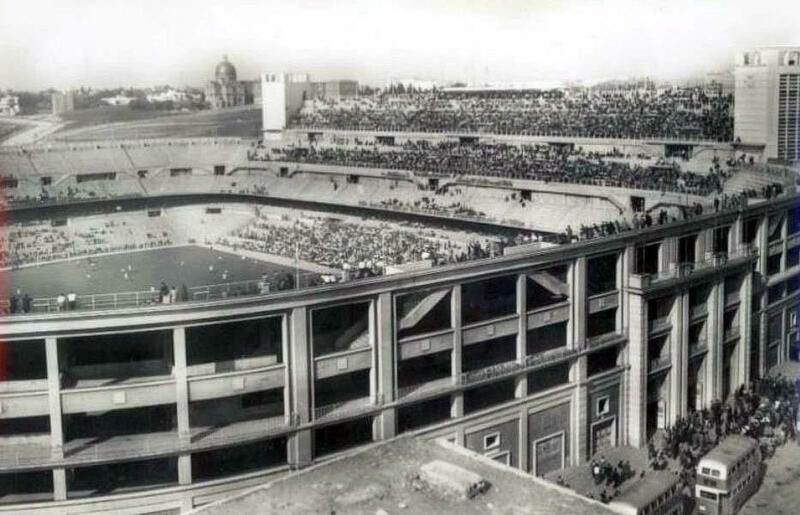 Construction began in 1945, and on the 14th of December 1947 Estadio Santiago Bernabéu officially opened with a match against Portuguese champions OS Belenenses (3-1). The stadium was initially still called Nuevo Estadio Chamartin, but received the name of the club-president eight years later. 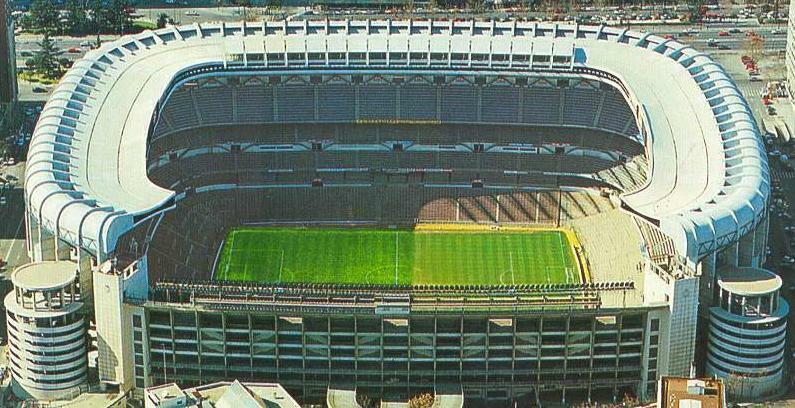 At that time, Estadio Santiago Bernabéu consisted of two uncovered tiers that could hold just over 75,000 spectators. Capacity was further increased to 125,000 in 1954, when one of the long sides got expanded with a third tier. 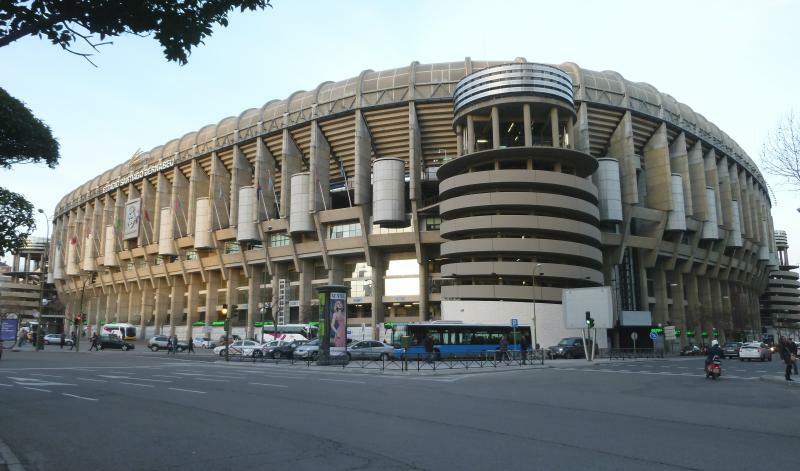 The Bernabéu was together with Camp Nou playing venue of the Euro 1964 Championships, hosting one of the two semi-finals and the final between Spain and the Soviet Union (2-1). Towards the end of the 1970s, the stadium had already started to age, and club officials started making plans to build a new stadium in the north of the city. 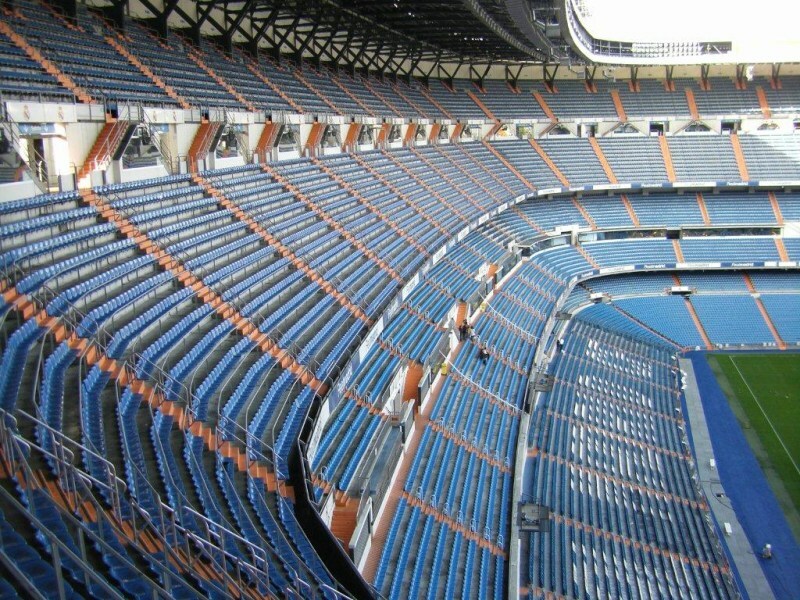 However, with the perspective of the 1982 World Cup it was instead decided to renovate the Bernabéu, which included the construction of a roof over the three two-tiered stands and the installation of seats in half of the stadium. As a result, capacity was reduced to 90,800 places. 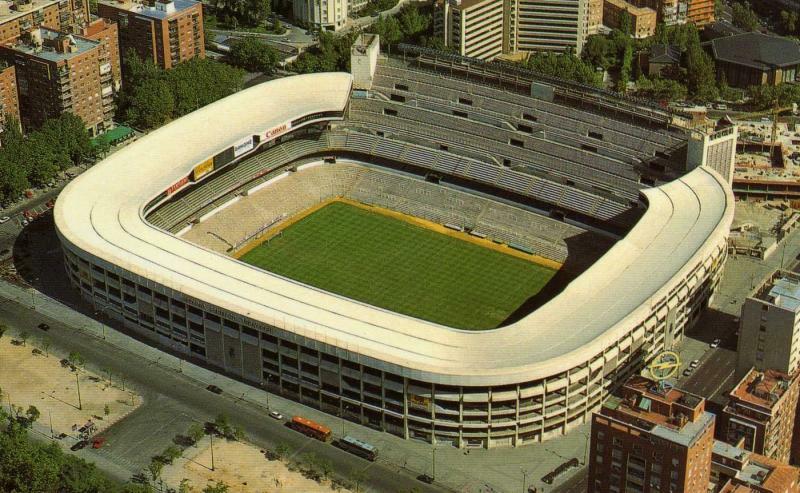 During the 1982 World Cup, Estadio Santiago Bernabéu hosted three matches in the second group stage and the final between Italy and West Germany (3-1). In the 1990s, UEFA required the stadium to become an all-seater, which would have reduced capacity to 50,000 seats. Club president Mendoza therefore started an extensive redevelopment program that included extending the third tier over the entire stadium, the creation of corporate facilities, and four access towers in each corner of the stadium. Works started in 1992 and were completed two years later. 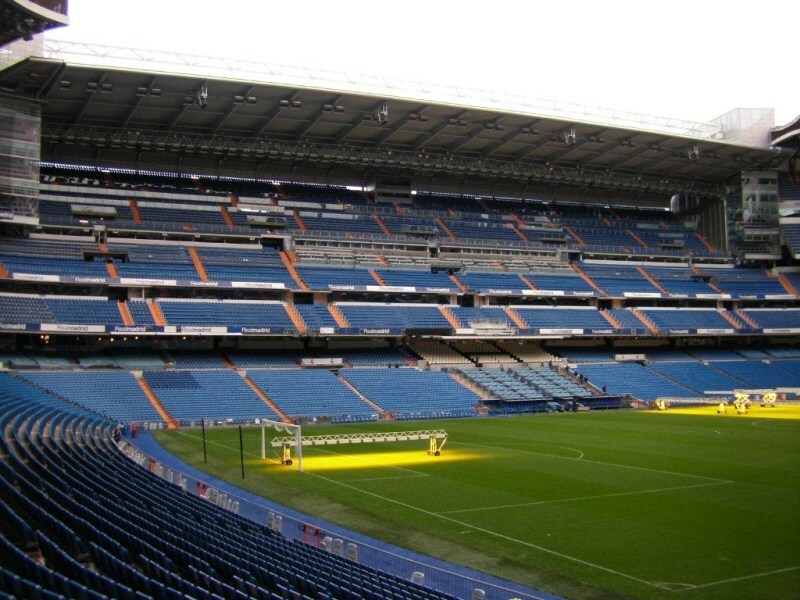 Estadio Santiago Bernabéu got further refurbished an upgraded between 2001 and 2006. Works most of all focused on improving corporate facilities, and were concluded in 2006 with the construction of a roof over the one remaining uncovered stand. 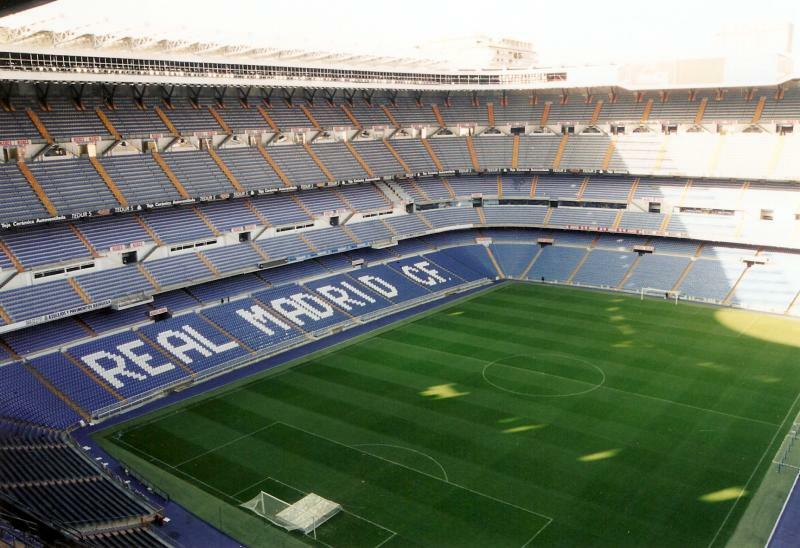 In its history, Estadio Santiago Bernabéu has hosted four European Cup and Champions League finals. The first final was in 1957 between Real Madrid and Fiorentina (2-0), the second in 1969 between AC Milan and Ajax (4-1), the third in 1980 between Nottingham Forest and Hamburg (1-0), and the last one in 2010 between Internazionale and Bayern Munich (2-0). 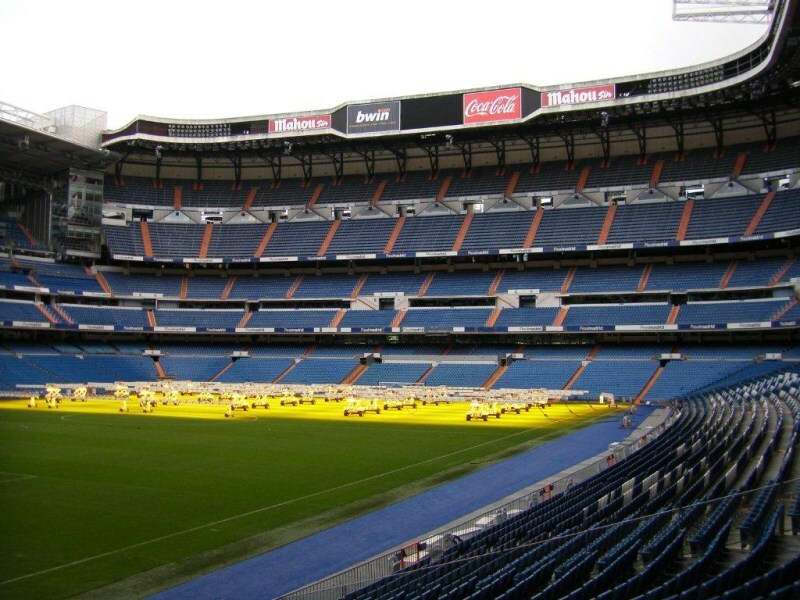 In 2o12, Real Madrid presented plans to further upgrade the stadium with commercial and corporate facilities, and to increase capacity to over 90,000 seats. Four architects were asked to present designs, from which the winner was chosen later in 2013. However, the project was first put on hold due to an investigation of the European Union into the granting of illegal state aid, and later rejected by the Madrid city council. Estadio Santiago Bernabéu is located in central Madrid on the Paseo de la Castellana, one of Madrid’s principal avenues. The stadium lies about 4 kilometres north of the Plaza de Cibeles, where the Paseo de la Castellana originates. It is a similar distance from Puerta del Sol, one of Madrid’s main squares. The stadium is best reached by metro line 10. Stop Santiago Bernabeu lies right next to the stadium. In the centre, line 10 can be caught at Plaza de España or Tribunales, but can otherwise be reached with a transfer (e.g. line 1 from Puerta del Sol or Atocha train station). From Atocha, Paseo del Prado, or Plaza de Cibeles one can also take bus 14 or 27 to get to the stadium. Take bus 14 in the direction of Avenida Pio XII. It passes the stadium on the Paseo La Habana. Take bus 27 in the direction of Plaza de Castilla, and get off at Plaza Lima, right in front of the stadium. From metro station Callao in the city centre, one can take bus 147. Take the bus in the direction of Barrio del Pilar and get off at Plaza Lima. From Puerta del Sol one can take bus 150 in the direction of Colonia Virgen del Cortijo. Again, get off at Plaza Lima. Estadio Santiago Bernabéu is located on the large tree-lined Paseo de la Castellana avenue, one of Madrid’s principal arteries. The area around the stadium is a mix of mostly offices, shops, and residential buildings, but there are enough bars and coffee shops mixed in to find something to eat or drink. 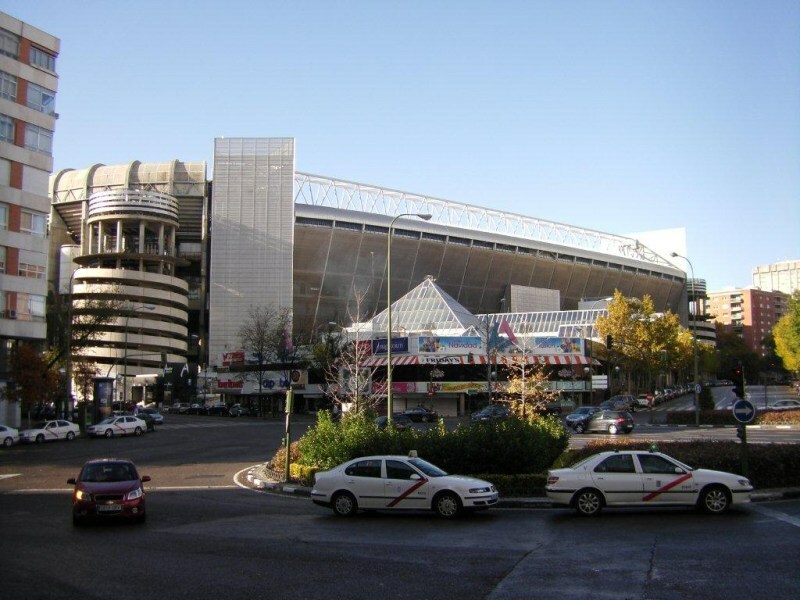 La Esquina del Bernabéu is a shopping centre built directly adjacent to the stadium and offers a small food court and some fast food outlets. A little further south is a branch of the El Corte Inglés department store chain. The number of bars and restaurants increase while you walk south in the direction of Madrid’s centre. Most nightlife is located in the northern parts of the centre. There are a fair few hotels near the Bernabeu. The Holiday Inn Madrid, AC Hotel Aitana, and Rafaelhoteles Orense are closest, get good reviews, but are far from cheap. Only slightly further away are Espahotel Plaza Basílica, Hotel Gran Atlanta, Hostal Falfes, Hostal Los Ángeles, and Sunotel Amaral. They get good reviews, are all close to several metro stations, tend to be reasonably priced between €50.00 and €100.00 per night, and no further than 20 minutes walking from the Bernabeu. 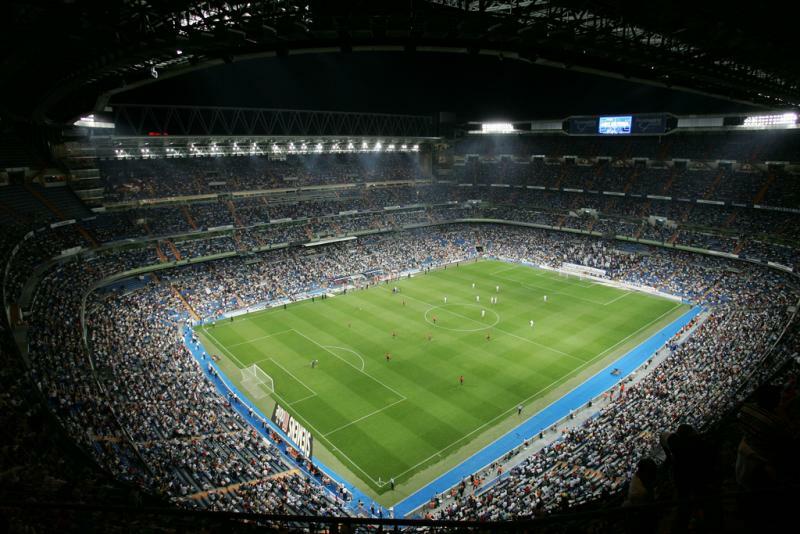 Click here for an overview of all hotels near Estadio Santiago Bernabeu. If you prefer to stay in the city centre or elsewhere, these are your options. 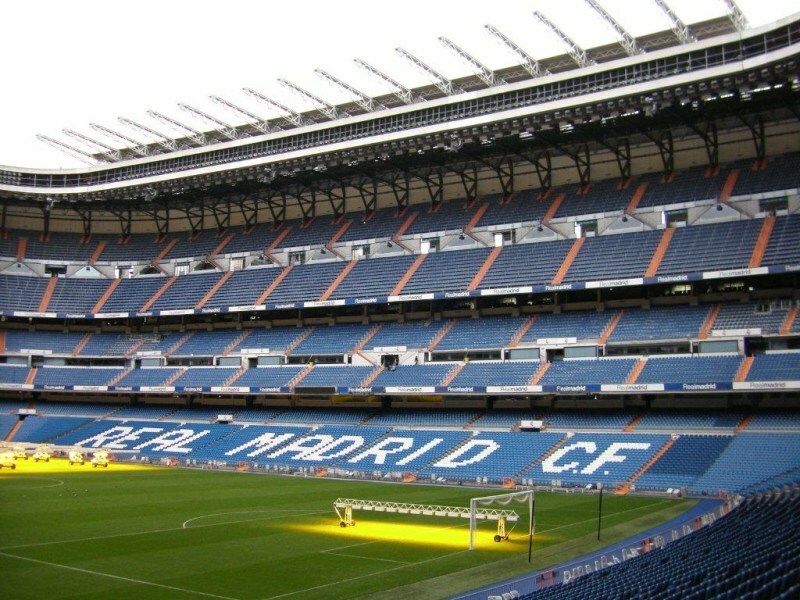 Tickets for Real Madrid games can be bought online through the official website or Ticketmaster, by phone +34 902 32 43 24, or at the ticket windows (taquillas) of Estadio Santiago Bernabéu. Tickets that are bought online can be picked up at the printing kiosks at the stadium. Regular tickets tend to go on sale in the week before the match, though VIP tickets are available earlier. 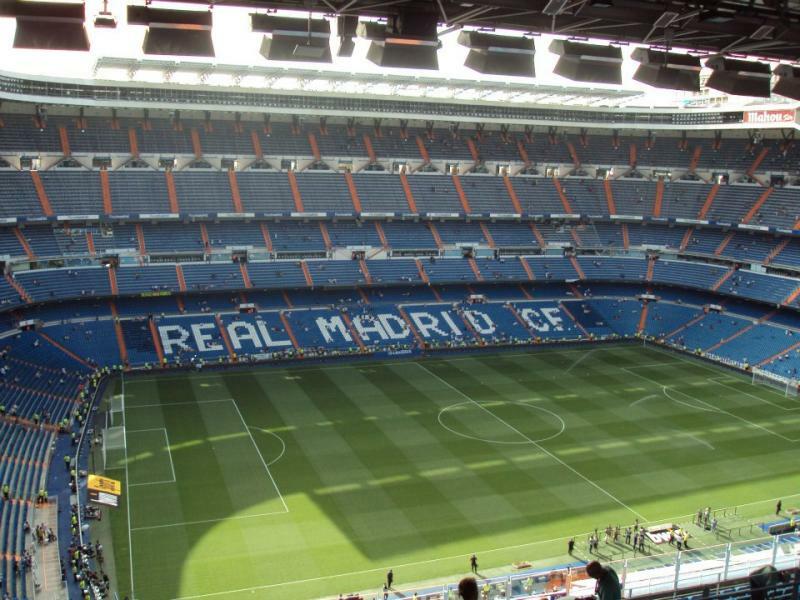 There is generally not much reason to buy a VIP ticket as Real Madrid only sell out a few high-profile matches per season and tickets for most matches are easily available if bought in advance. For those matches that do sell out, e.g. El Clásico, the Madrid derby, and high-profile Champions League matches, you might have to revert to the secondary market. The likes of viagogo and Ticketbis offer good choice and tend to be reliable, though can get expensive. Prices for regular matches tend to be competitive though or even lower than face value and can offer an alternative for those wanting to book their tickets longer in advance. Ticket prices depend on the opponent, but typically start at €30.00 for a seat behind the goal and €40.00 for a seat at one of the sides. 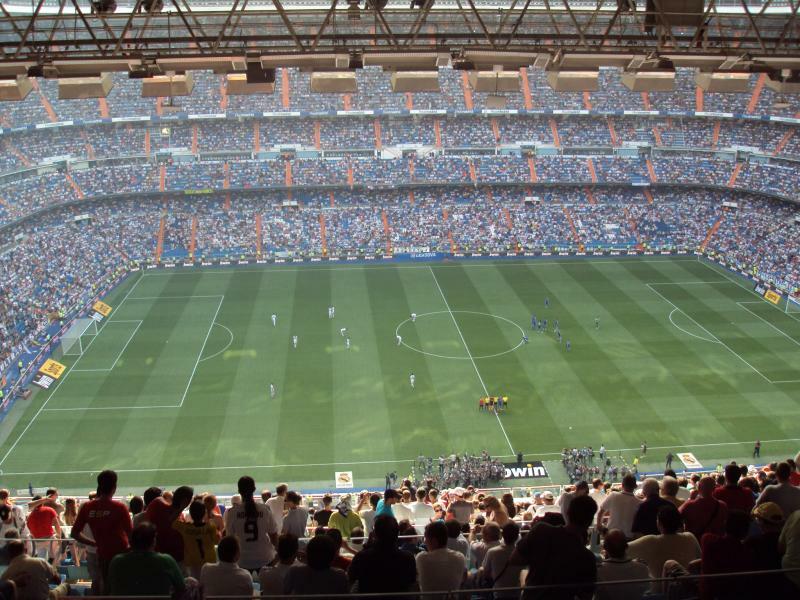 Real Madrid offer self-guided stadium tours, during which you follow a route through the stadium. The route includes the dugouts, presidential box, press room, changing rooms, players’ tunnel and trophy room, and ends in the club shop. The stadium is opened Mondays to Saturdays from 10:00 am to 7:00 pm, and Sundays and public holidays from 10:30 am to 6:30 am. On matchdays the tour is open until 5 hours before kickoff (though with limited access). No reservations are required, though the tour can be booked online. Entrance costs €24.00. For more information call +34 91 398 43 70. Realmadrid.com – Official website of Real Madrid CA. 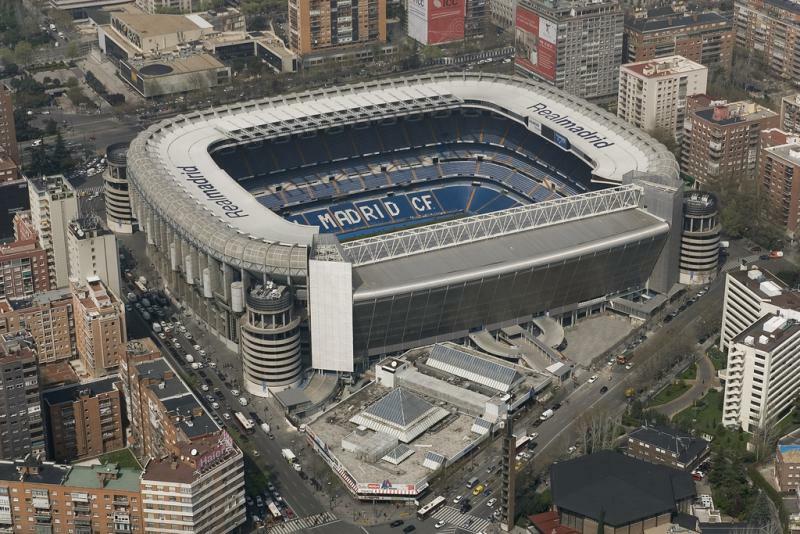 I have just read your stadium review and, as a local Real Madrid fan, I must say it’s very complete (congratulations!). However, there is some recent information I’d like to let you notice so that you might be able to correct them and prevent further users be misinformed about the current and future condition of the stadium. The most notable point which lacks updating is on the renovation project. Though it was blocked before by the city council and the European Union, there has been a lot of bureaucratic movement these last years and now only the go-ahead from the city council is needed to start renovating the stadium (which, giving how well have recently been the relations between the club and the city council, is pretty much granted). That last step is said to be done in just a matter of weeks or months so that construction work would start in summer 2018 to be finally finished in mid-2020. Once we are authorized to renovate the Bernabéu and manage to finish the renovation, we could be talking about one of the best stadiums in the world (if not the best). Will the renovation interrupt football-related activity in the stadium? Of course not: football-inhibiting work will be done in winter and summer breaks so that the stadium will be always ready to host matches except for those periods of time. 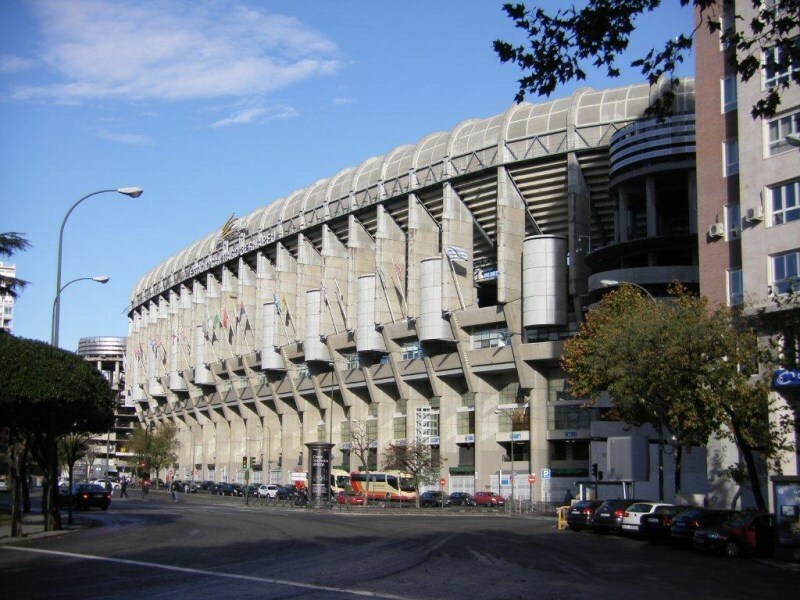 Apart from that, the renovation will not only affect the stadium: but the Esquina del Bernabéu shopping center will be completely demolished to build a new 6000 Sq Plaza de los Sagrados Corazones and another green zone will be opened between the stadium and the Paseo de La Castellana. That is pretty much everything that was needed to say. With such a renovation, the stadium will be an arhitectural jewel as well as a Mecca for football fans. As a recommendation to improve the information provided in the page, I’d like to suggest adding these points to the page: design description, capacity distribution and locals’ and fans’ opinions on the stadium. That’s all from me. I hope I have provided good and useful information to the users. Thanks for reading! Best stadium in the world. Ive seen Madrid play on 6 separate ocassions. perfect size of 85,000 and so close to the pitch gives it an incredible enclosed sensation. The tour is another incredible experience. Cant wait to see the new stadium. Would have to be mindblowing as it is already an incredible stadium. I went to watch Real again, this time against Malaga. Unfortunately it finished 0-0. Bought my ticket at one of the ticket windows before the game. It is worth mentioning that free match day programmes are available from inside the stadium. The support was not the best. The stadium itself is beautiful and well worth visiting. The most beautiful stadium i have been to. Great location. I went to watch Real against Ajax in Champions League. Bought the ticket at the ground for 35 Euros. It is massive and even if you are sat at the very top you still manage to see everything as the upper tiers go up rather than up and back. The support from Real fans was good, but Ajax fans were amazing! Great place to go. I was there on 14/03/2012 CL game against CSKA Moscow the game wasn’t that exiting but it is the most beautiful stadion in the world same infrastructure like AC Milan. Just lik twin stadions i also was in Milan for stadion tour also beautiful. I defenetly go back this season to Real and perhaps watching a game of ACMilan also. I agree its a wonderful stadium and right in the city centre. In some ways a bit like St James Park in Newcastle except it seats 80,000 plus and the climate’s better!!! watched Real come back to win against Espanyol and atmosphere was electric – match ended around 11.30pm then on to a few bars and back to hotel in time for breakfast. Fantastic stadium and atmosphere. I saw RM v Espanyol and as it was January they had heaters warming the fans from the stand above, so although it was cold I had to shed some layers. 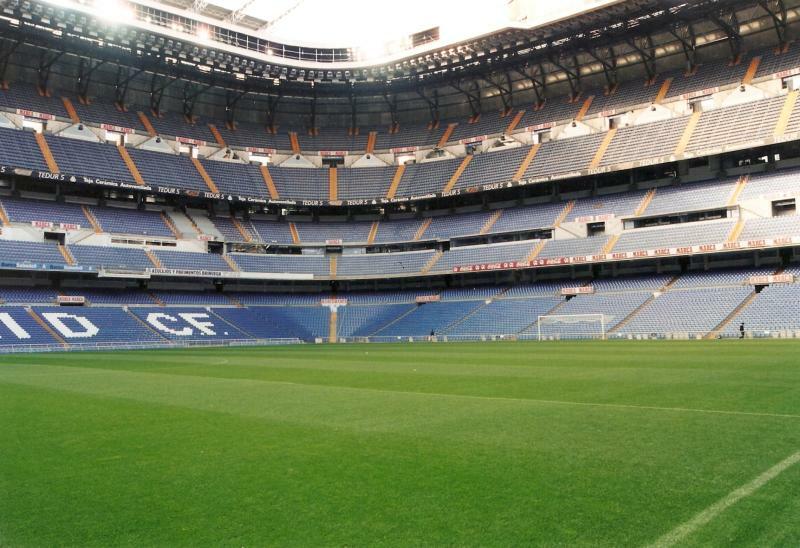 The Santiago Bernabeu is a fantastic stadium to visit when you are in Madrid! 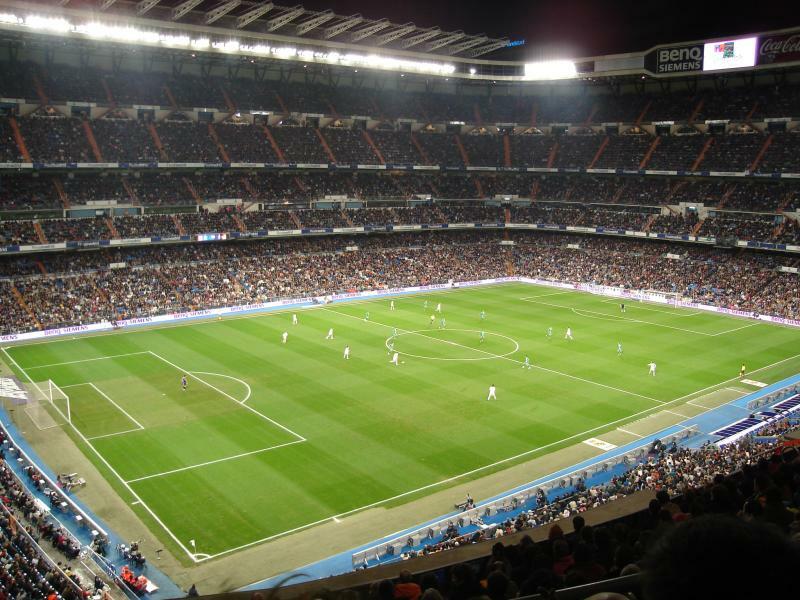 I watched Real Madrid play against Real Zaragoza at the Bernabeu last year (2011) and they lost 3-2 but still the experience of watching Real Madrid was amazing and fantastic! I loved the singing from the Ultras Sur end! 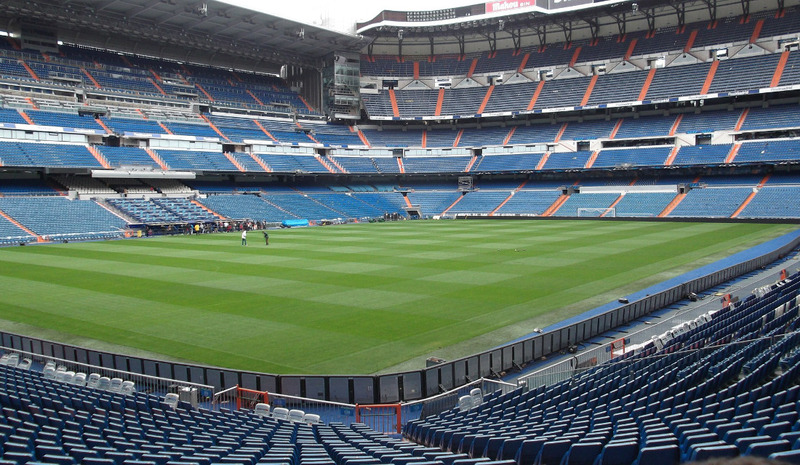 I really recommend visiting the Bernabeu if you are in Madrid because it is a massive stadium and it’s amazing! I did the stadium tour aswell on the day I was leaving Madrid! I am going back to Madrid and the Bernabeu this year (2012) to watch another Real Madrid match and they play against Sporting de Gijon this time! I hope they win this time and not lose! Very pleasant tour but if you don’t have a guide, there is no-one you can ask questions to. You do not go into the home team changing room. You go up the tunnel to get there and so do not have the experience of going down the tunnel to enter the stadium in the style of the players. Also, you cannot sit on the Real Madrid manager’s seat. In these respects, the tour at Manchester United is much better. I had an excellent tour guide, Marianne.